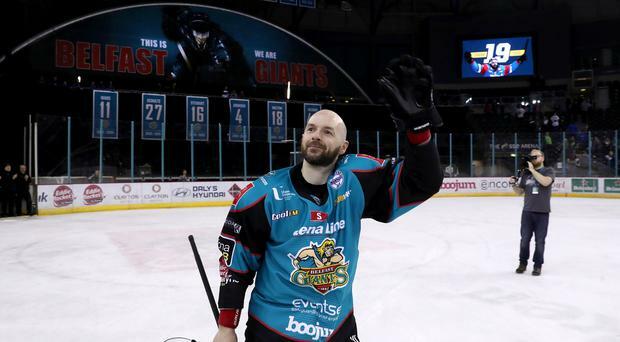 The Belfast Giants have done as much as they can. Now they must wait and hope. A thrilling 6-4 victory over the Dundee Stars in their final Elite League game of the season has the Giants locked on 92 points with the Cardiff Devils - who hammered Milton Keynes Lightning 9-1 at the top of the table. The Devils, however, have one more game to play and a single point against Coventry Blaze on Sunday will see them retain the title. A Blaze victory in regulation time will send it to Belfast instead. Thirteen years ago the Giants were crowned champions while sitting at home when nearest challengers the Newcastle Vipers lost to the Edinburgh Capitals and they can only hope that the same scenario plays out on Sunday evening. Knowing that only a win would do if they were to maintain any realistic hope of taking the title the Giants got off to a dream start when they opened the scoring with less than a minute on the clock. Murphy collected the puck from Blair Riley and cut in from the right before firing his shot over the goaltender's left shoulder with only 52 seconds played. Dundee stopped that early momentum in its tracks when they silenced the crowd with an equaliser on 5:57, Charles Corcoran cracking a one-timer past Tyler Beskorowany. It looked like the Giants had a firm grip on the game when they followed up that equaliser by netting twice inside 38 seconds. Jonathan Boxill pounced on the rebound after Dustin Johner's shot to sweep the puck into the net at 8:37 and while the huge crowd inside the SSE Arena was still cheering that goal Johner slipped a great pass into Kyle Baun and he clipped in from a tight angle on the right. Dundee were level before the end of the first period with two goals in as many minutes. First Matt Marquardt picked his spot in the top corner before Jordan Cowie netted. Then Murphy produced a great finish, shooting across the goaltender Pontus Sjogren from the right and finding the bottom corner. A well worked move between Bissonnette and Lukas Lundvald Nielsen set up Corcoran for his second of the night at 37:57 to increase the tension. That wasn't on the Giants' agenda though and after pushing hard for the entire third period the go-ahead goal finally came at 46:46. Riley fought for the puck behind the goal, pulled it out to Murphy on the right of goal and he sent it right across the front where Patrick Dwyer was waiting to finish. Dundee pulled Sjogren in the final minutes in an attempt to take the game to overtime, but Baun struck his second with a cool finish to ensure that wouldn't happen and now the worst case scenario is that the Giants end up second by the slim margin of just two points.